The Freshwater Village Plaza has dominated the Freshwater village landscape for donkeys. It houses an Orstrayan China that should be heritage listed, an IGA, a hodgepodge of service offices, a butchers, a cafe, a takeaway joint and a good old fashioned roof top car park. It is the most unlikely location for the newest venture by the blokes that used to own Hemingways. 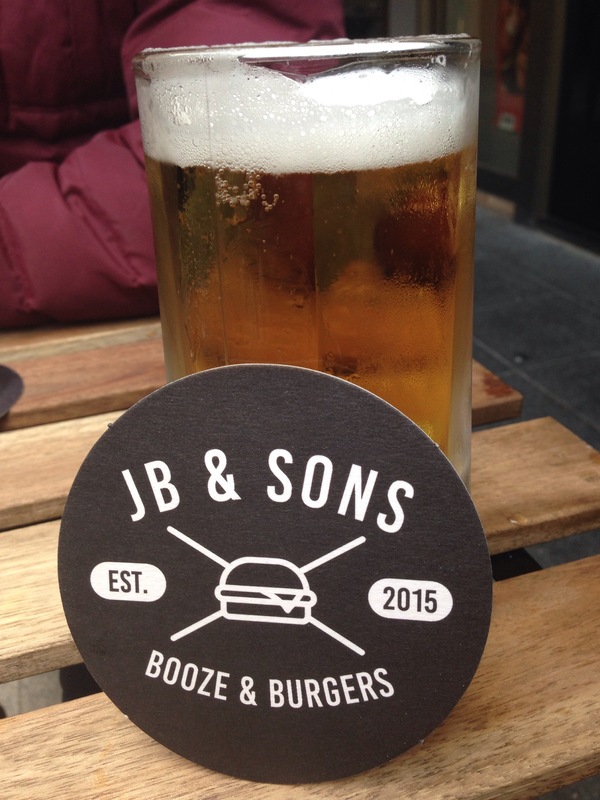 JB & Sons Booze and Burgers has opened on the ground floor and has a surprisingly spacious indoor area as well as good chunk of tables in the plaza area. They’ve invested in a decent sound system and collated a good Sunday arvo blues playlist with volumes that enable you to talk. The food menu is very straightforward. 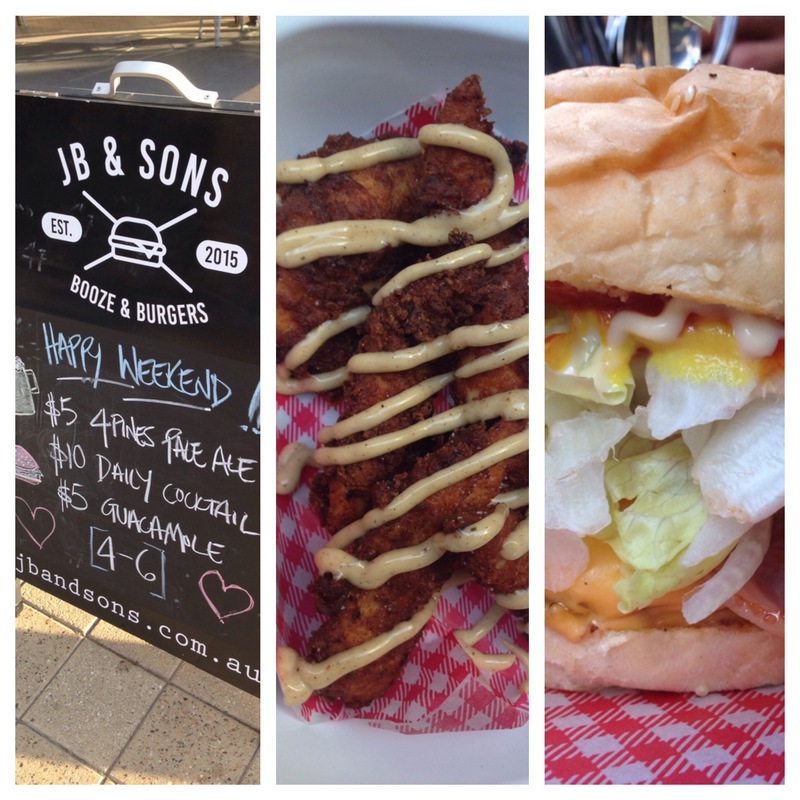 Big emphasis on burgers, with an excellent accompanying range of snacks like the JBFC. Buttermilk battered fried chicken morsels/chunks/tenderloins are a real entree du jour right now, which is fine ’cause it’s good. Loved my Papi burger which featured pickles amongst other things. The Septics certainly have it right when they marry a pickle with a burger. The rolls used remind me of high school tuck shop days – crusty but soft on the inside. If you going to describe yourself as “Booze and Burgers”, then your burgers need to be good. These burgers are better than good. The beer list is very good for a very small space. Very pleased to see four taps on the go, as well as an eclectic range of bottles and tinnies. There’s everything from the lamentable but extremely affordable Martens Pils in a tin to a Brewcult Hop Zone in a stubbie. 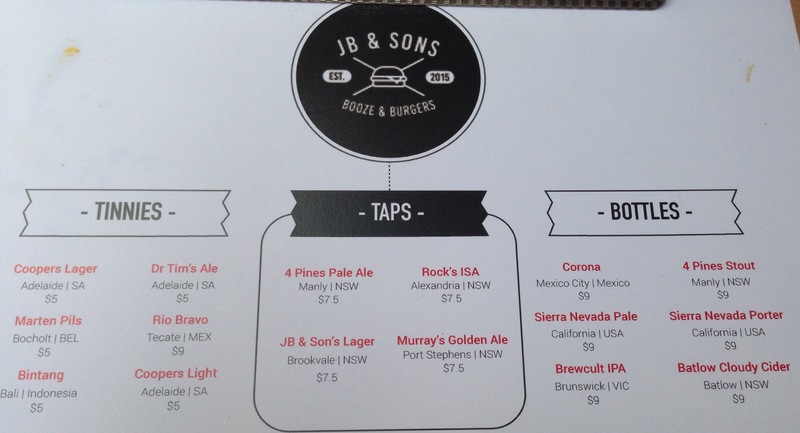 Of particular note for @untappd unique geeks, there’s JB & Sons Lager on tap. Despite badgering two staff with questions about the beer’s provenance, its origins are a tightly held secret. Thought it might be Gang of Four, but is there another Brookvale Brewery on the horizon? So Freshwater continues to add places to go. This’ll go off as the word gets out.